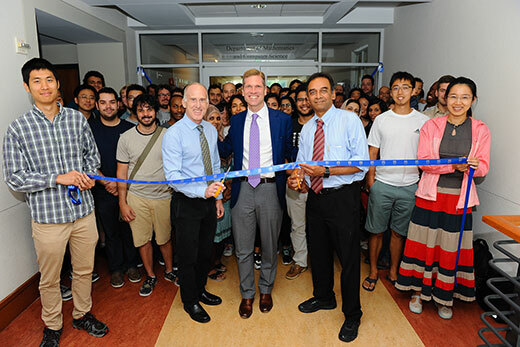 The Department of Mathematics and Computer Science in Emory College recently held a ribbon-cutting to celebrate separating into two standalone departments. Emory College Dean Michael A. Elliott (center) stands with James Nagy (left), the new mathematics department chair, and Vaidy Sunderam, the new computer science department chair, as they prepare to cut the ribbon. The Department of Mathematics and Computer Science in Emory College is undergoing an amicable separation this year into two standalone departments. The change is, at the moment, a subtle one but with big payoffs expected in the future. The departments continue to share space on the fourth floor of the Mathematics & Science Center and some joint faculty and courses. The official separation, however, allows both to build on their growth and deepen their core strengths: security, data, high-end computing and informatics in computer science, and abstract algebra, number theory, scientific computing, analysis and discrete mathematics in math. In recent years, both fields have continued to grow in popularity, a change reflected in undergraduate enrollment at Emory College. As of summer term, 160 undergraduates had graduated from one of Emory College’s math and computer science degree programs in 2017-18, a 31 percent increase from four years earlier, and majors continue to increase. That growth has been in different areas. Mathematics has developed interdisciplinary ties with the departments of physics and chemistry and the Emory School of Medicine, for instance, on medical research and developments in artificial intelligence. It also has furthered its excellence in more theoretical subfields such as abstract algebra and number theory. Computer science has zeroed in on big data, working with the School of Medicine, Goizueta Business School and College departments such as linguistics and psychology on research into machine learning, security and storage issues, says Vaidy Sunderam, who will serve as computer science department chair. “Emory computer science is data centric, on the cutting edge, and now we can grow even more in that domain,” Sunderam says. Both departments are conducting searches to expand next year. The change pleases Harshita Sahijwani, a PhD candidate in computer science who is on the Emory team selected among eight worldwide to create a social bot and compete for this year’s $1.5 million Alexa Prize from Amazon. “It won’t affect students immediately but will help the departments expand for the future, for future research and students,” she says.